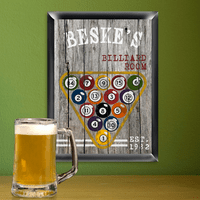 FEATURES/SPECS This pool table theme personalized bar sign will be the finishing touch to your billiards room. 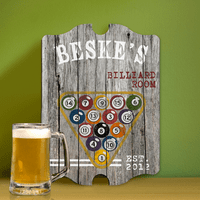 Made of composite wood, it features a set of pool balls and a cue on top of a green felt pool table. It includes two whimsical sayings. 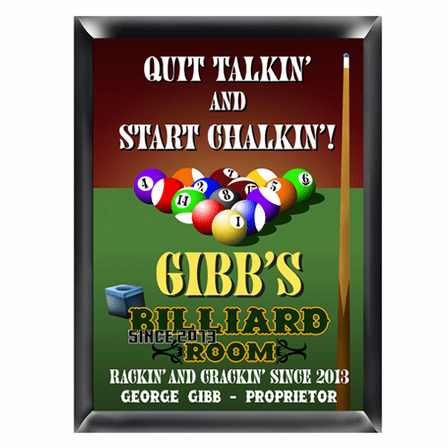 Up top are the words "Quit Talking and Start Chalking." 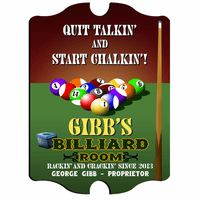 At the bottom of the sign, it says "Rackin' and Crackin' Since 2014 (or whatever year you specify)". 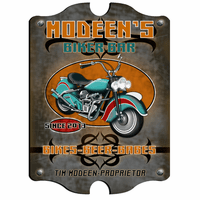 This sign is a perfect gift for your groomsmen and will list them as the proprietor. Comes painted with the words "Quit Talking and Start Chalking"
Was a gift for a friend. Came out awesome. The person's name came out great. Everything looked wonderful.